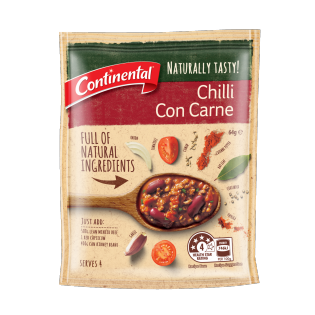 Continental Naturally Tasty Chilli Con Carne is a recipe mix full of natural ingredients, so you can create a delicious meal the whole family will enjoy! Vegetables (48%) [tomato (powder, pieces), onion], spices (paprika, garlic powder, coriander, pepper, cumin), wheat flour, sea salt, sugar, vegetable oil (corn, sunflower), potato starch, bay leaves. Allergens:Contains wheat products. May contain milk and egg. Just add... 1 tablespoon sunflower oil 500g lean minced beef 1 red capsicum, diced 1 pack Recipe Base 1¼ cups (310mL) water 400g can kidney beans, drained and rinsed Rice to serve Preparation time: 5 minutes Cooking time: 15 minutes 1. Heat oil in a frying pan and brown mince and capsicum 2. Add Recipe Base and water, bring to the boil stirring, cover and simmer gently for 10 minutes. 3. Stir through kidney beans and heat through. Serve with rice, mashed avocado and salad.